I have been reading John Toland’s The Rising Sun, a chronicle of the rise and fall of the Japanese Empire in World War II. The book is somewhat pro-Japanese, describing many of the atrocities reported were isolated incidents and the hesitance of Emperor Hirohito with declaring war with the United States. It gave several explanations as to why the United States, after being attacked by Japan, gave early priority to Hitler (it was Churchill’s influence) and why the Bataan Death March occurred (the Japanese never resorted to surrender and so didn’t have a clear procedure on the treatment of thousands of captured enemy soldiers). I also found out that the Japanese’ invasion of China happened years before Pearl Harbor and that Fortress Singapore was taken because the Imperial Army biked across Indochina to attack the unprotected North shore (the British guns faced towards the sea and couldn’t be turned around). Also, the Japanese didn’t have radar and didn’t know their military codes were broken the entire time, leading to America’s advantage over them. 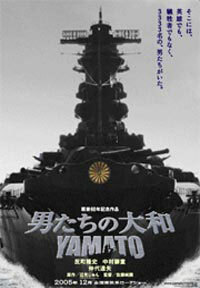 Excited with all this war drama, I got to watch Otoko Tachi no Yamato, a 2005 Japanese film about the largest battleship ever made from the point of view of the crew members. Of course, all of this was experienced with 300 in mind. If you knew you were facing defeat, would you fight, anyway? So what did I take away from the book and movie? The Philippines must never attack another sovereign nation. The Japanese has a warrior culture, but little resources. The Philippines has neither. Sure, the losers of World War II are now thriving economies, but I think that speaks of the populations’ inherent attitudes. And they still have American bases stationed within their borders to this very day. I’ll try looking for WWII Pacific battle films in the coming weeks, and rewatch Pearl Harbor, again. For WW2 (Pacific Theater of Operations) Films, I strongly recommend Letters from Iwo Jima (war from the Japanese side by Clint Eastwood; Ken Eatanabe playing another honorable but doomed Samurai) as well as the Great Raid (Cesar Montano as a Guerilla Leader). As for Pearl Harbor, skip the Affleck-Bechinsdale-Hartnett love triangle scenes. The filmbetter off without it. You should also dive online and St Francis Square for Reiji Matsumoto’s The Cockpit Anime Trilogy (there’s a story there on a Kamikaze pilot) and Zipang. I’ve watched the Great Raid, albeit with thai subtitle and it wasn’t that great, I’ve also watched the Thin Red Line which was too Pro-American and I ended up thinking what if the Japanese were our colonizer rather than the States? It occurred to me we be better off if we haven’t been colonized at all. We’ve watched Letters from Iwo Jima and I have no interest in watching Flags of our Fathers.. Pearl Harbor was so-so.. Try “Empire of the Sun” this one of my most watched movies.